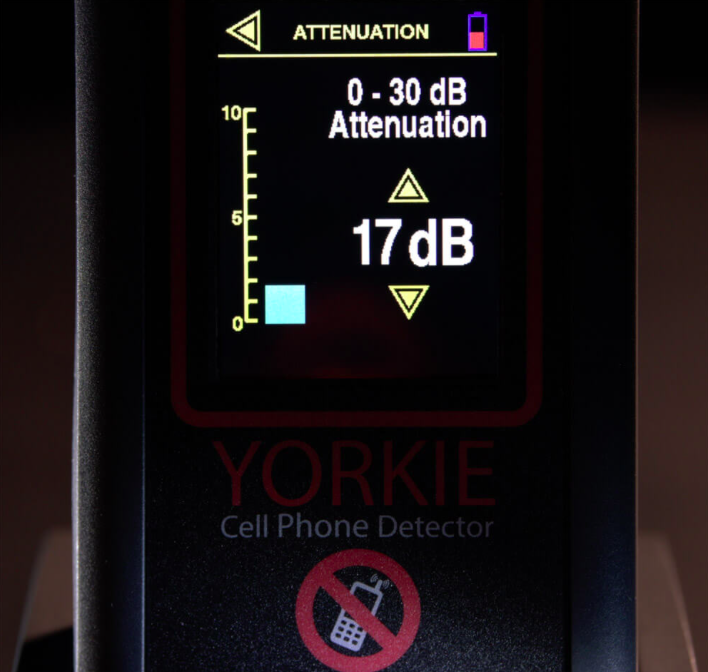 Yorkie™ contraband mobile phone detector is a handheld receiver designed for covert wireless contraband detection. Yorkie’s light weight, sleek profile and colour touchscreen make it ideal for all day use by security personnel, corrections officers and any law enforcement agent requiring a NO MOBILE PHONE policy in their facility. It is small enough to fit into most pockets to offer vibrating alerts all day to security personnel. This dedicated receiver is ultra-sensitive and able to sniff out all active mobile phone use up to 45 metres away using any removable SMA antenna. And since the receiver is passive and does not communicate nor intercept any cellular data at all, it is completely legal and RF invisible. Users can also adjust threshold levels instantly and set attenuation for noisy RF floors for any facility. Yorkie’s internal battery is easily charged in the included dock which also allows the unit to become a 24-7 contraband detection monitor right from your desk. Yorkie’s internal battery is easily charged in the included dock which also allows the unit to become a 24-7 contraband phone detector and monitor right from your desk. 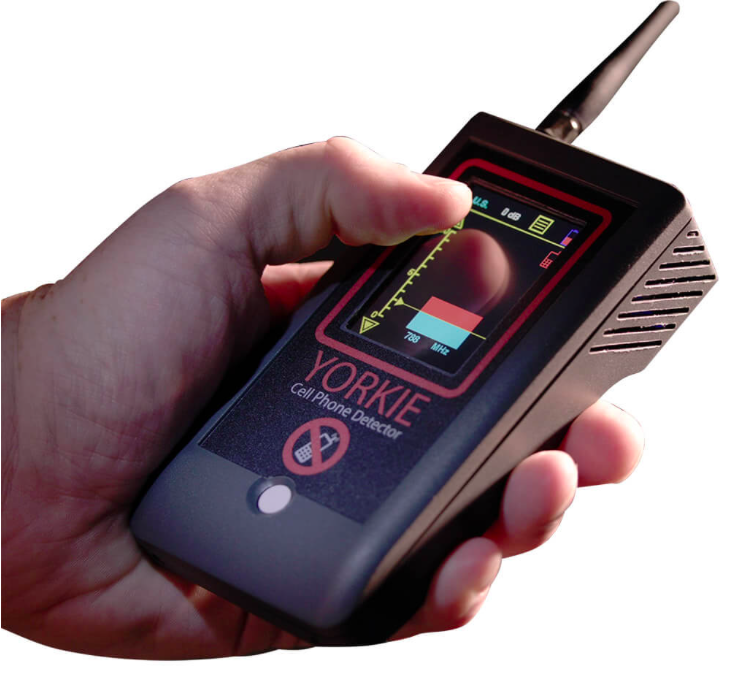 Yorkie includes vibrating and audible alerts but those can be toggled off for more covert RF sweeps in prisons, government facilities, military bases, confidential board room meetings and even call centres that do not allow mobile phones. 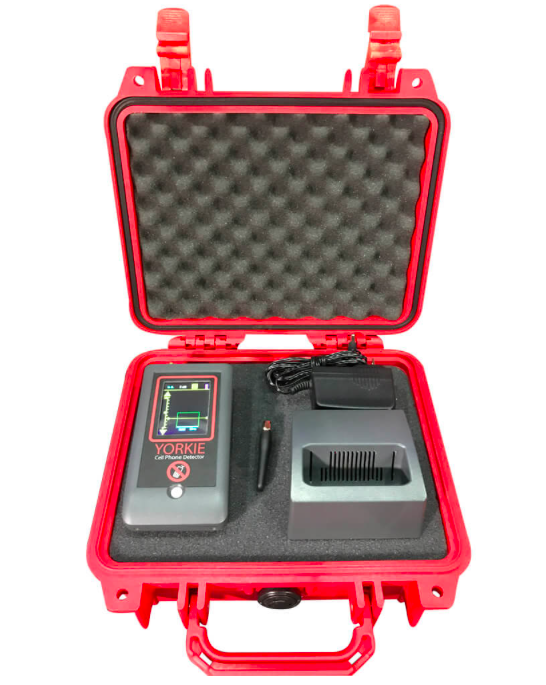 Perfect for contraband detection in prisons, law enforcement facilities, government buildings, etc. Does Yorkie identify callers or their phone numbers? No. 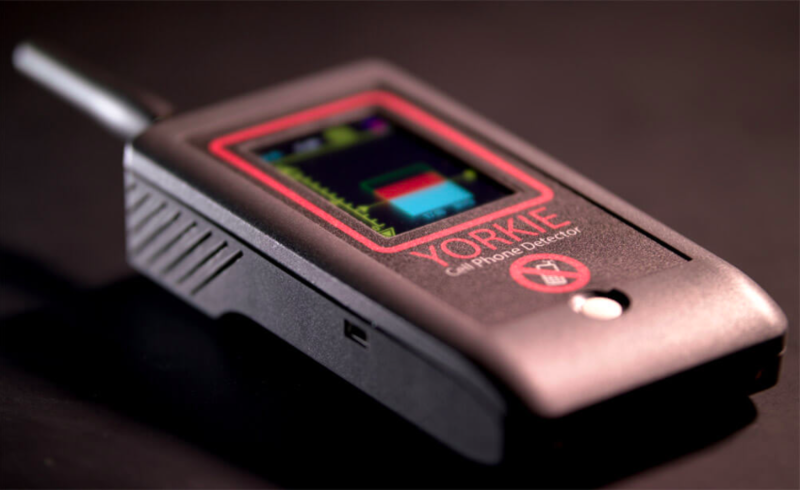 The Yorkie mobile phone detector is a precision RF cellular scanning device that identifies mobile phone activity (both standby mode and active modes) and assists in locating them. 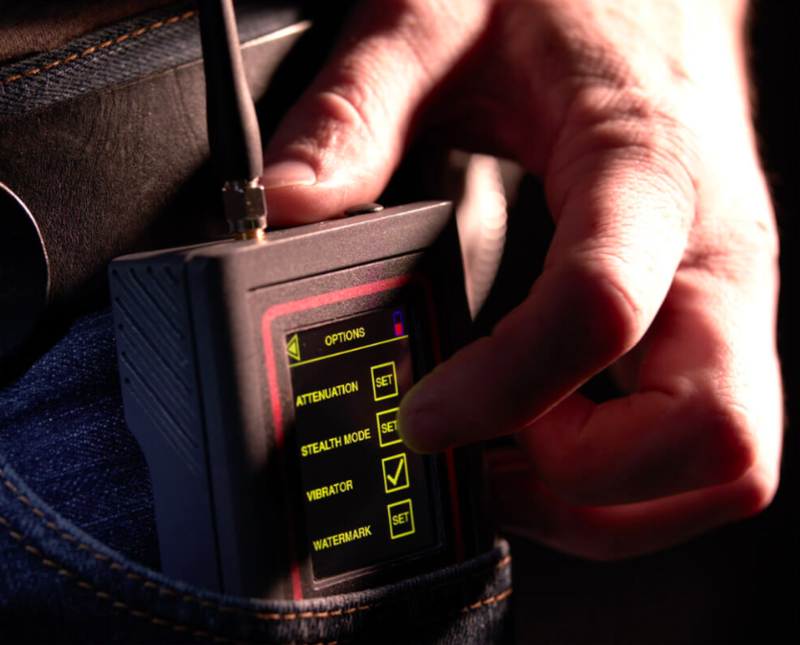 It is a wireless tool used by security officers and personnel that require a NO WIRELESS security policy. Typical range is about 30 metres but this varies depending upon the environment. Yes. Yorkie vibrates with more frequency as the signal grows stronger. Can I detect mobile phones in standby mode? Yorkie can detect mobile phones in the standby mode but keep in mind when a phone is ON in standby, it is not constantly transmitting. Phones register to the local cell tower/base stations at different intervals that the tower/carrier determines (could be every few seconds, minutes, and we have seen up to 20 minutes). When a phone registers it is a short pulse less than 1 sec so the BLUE LED will light up quickly and the unit will vibrate. On the display, the watermark above the signal strength bar would also indicate that a pulse of RF energy was detected too. If you take your phone and put it next to Yorkie and shut off your phone completely wait a few minutes then turn the phone on your phone should try to register to the base station and you should see a short flash on the Yorkie.